All the best Outbreak Nutrition Survive Whey Protein Blend deals in one place! Compare prices from all the top online stores to find the best price on Outbreak Nutrition Survive Whey Protein Blend. Fitness Deal News does the hard work for you of finding the best deals & coupons on everything fitness. Fortified With The Addition Of Red Panax Ginseng Which Provides Added Benefits Like Increased Mental Cognition, Athletic Enhancement, Immune System Enhancement & Increased Heart Health! Getting high quality protein in these post apocalyptic times has always been tough… The blood of your enemies is good, but it doesn’t come in chocolate. 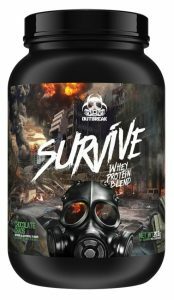 Survive is a premium whey protein blend. Packed with 25g of protein per serve, Survive is made up of fast-absorbing Whey Isolate and slow-absorbing Whey Concentrate. This combination delivers protein to muscles rapidly but also ensures supply over a longer period. Survival Whey has been fortified with the addition of Red Panax Ginseng, which provides a wide range of clinically proven benefits. These benefits include increased mental cognition, Athletic Enhancement, Immune System Enhancement, and increased heart health.